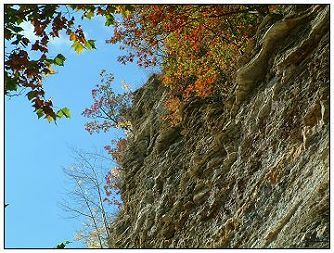 Called Valentine's Point or Outlook Point by some - Lookout Point is a very narrow rock peninsula that cuts out into Zoar Valley Canyon. 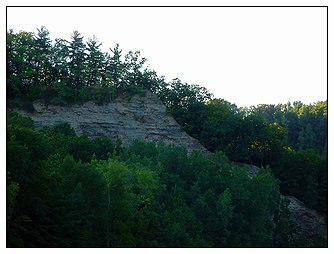 Lookout Point's 180' height gives an excellent view of the Valentine Flats area up to the Confluence and Martin Point. The area is dangerous and much care should be taken while viewing from it. The drop off is straight down as shown in the second picture below. The view down Valentine Flats is one of the best in the area with Martin's Point prominently in the background. 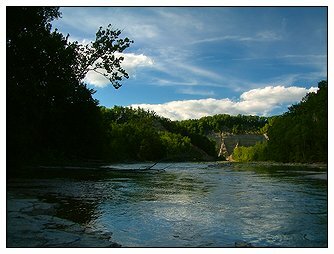 A must visit site for all travelers to Zoar Valley. It is easy to get to - from the Valentine Flats parking lot area hike into the designated trail and when the trail splits take the trail to the left. Walk along the rim of the canyon with great care and in no time you will be at the Valentine Point. 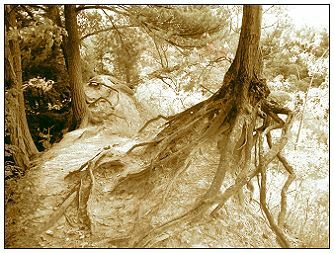 Great care MUST be taken while on Valentine Point as it is a narrow strip of roots and stone with not much room to move around. The hike from the parking lot is short and easy to make. Along the rim hike to Valentine Point notice the Ancient Forest containing primarily hemlock, but with some red maple, black cherry, beech and red oak trees mingled in. This upper plateau Ancient Forest contains trees that are estimated to be 150 to 300 years old. 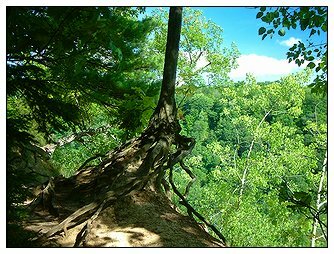 Unique trees overhang the canyon cliff with tangles of exposed and twisted roots dot the area as shown below. 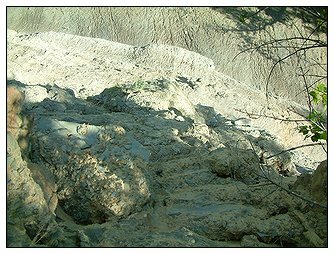 It is possible to climb down the back side of Valentine Point to the canyon and creek bed floor by using these "tree root ladders." The climb down is very is difficult, the climb up easier but still only recommended for experts and those in good physical condition.